Do you put bans on yourself for buying makeup ? The lipstick which I am going to review here was also bought during a massive sale on Essence Cosmetics at Priceline pharmacy in Melbourne. Essence is already an affordable drugstore brand and when it's on sale that you just can't afford to miss it. Due to sale, most of the shades were sold out and only 2-3 were left so I grabbed those all. Check what else did I get in my Essence makeup haul here. 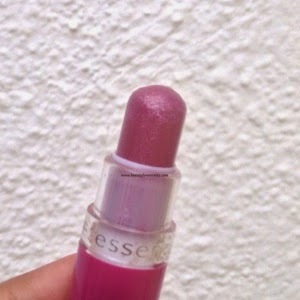 I bought this gorgeous Essence lipstick shade no. 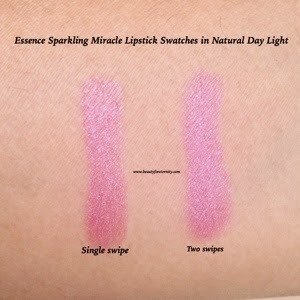 12 Sparkling Miracle along with Essence lipstick shade no. 60 Cutie Mac Cute. Both of these lipsticks are from the same range and are glittery. Packaging: First thing first, the packaging is similar with Cutie Mac Cute because both of the lipsticks are from same range. It's light weight, colour coordinated tube which is sturdy. I actually have accidentally fallen this lipstick on the floor so many times but it stayed intact always. The color coordinated packaging makes it easy to find this lipstick in a second. 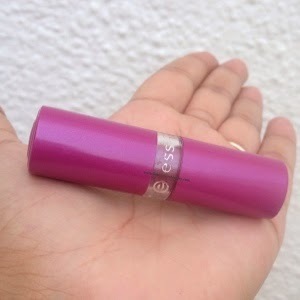 With regular use the cap of the lipstick tube did loosen a bit but despite of that it never got opened up in my handbag. 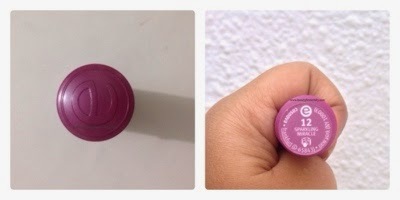 The brand logo of essence is engraved on the top of the lipstick cap as well as printed on the clear band which is present in the middle and comes off very easily which makes the packaging look cheap but I really don't bother about that. The shade no. 12 and name 'Sparkling Miracle' are given on a sticker pasted on the base of the lipstick tube. Overall, packaging is sturdy, travel-friendly, small, lightweight and user-friendly. Colour: This lipstick, Sparkling Miracle from Essence looks like a rich and deep berry sort of a shade in the lipstick tube but comes out to be muted and wearable berry shade on the lips. It looks like having slightly brown undertone in the natural light and blue-ish/purple-ish undertone in the artificial light. It has got fine glitter particles in golden and silver colour which impart a shiny finish to this lipstick. It gives me nicely tinted shiny lips in one swipe and on layering it gives a better colour. This particular colour suits medium/olive/tanned skin as well as fair skin unlike the Cutie Mac Cute which is for fair skin only. Pigmentation: Sparkling Miracle is slightly more pigmented than Cutie Mac Cute because it covers the pigmentation on my lips to a considerable extent. It can't be called a richly pigmented lipstick but is definitely much better than Cutie Mac Cute. Finish: Sparkling Miracle from Essence is a glittery lipstick with fine golden and silver glitter particles, which gives a shiny finish to the lips. Despite of containing glitter, it does not look loud once you wear it although it does look glittery when in tube. Texture: Sparkling Miracle from Essence has a soft and moisturising texture. 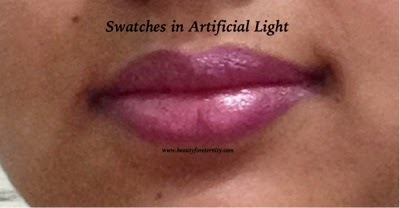 Despite of being loaded with fine shimmer, it neither feels gritty nor tugs or pulls the lips. It glides very smoothly on the lips and gives a good wash of colour in one swipe and becomes more opaque in 2-3 swipes. It contains castor oil so it's rich in vitamin E and feels like a lip balm on the lips. I have applied it on my bare lips without using any lip balm underneath and it felt really nice. It's formula is light weight yet moisturising. Staying Power: Being moisturising, Essence lipstick stays only for 3-4 hours on maximum. It survives the meals to some extent. 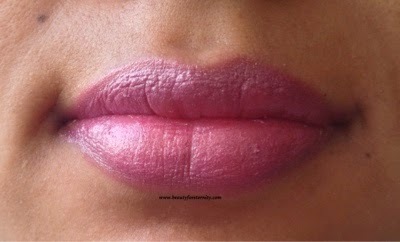 After wearing off, it leaves the lips evenly stained in pink colour with glitter particles stuck to lips. 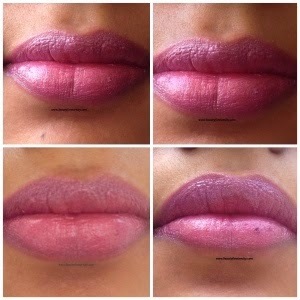 Application on lips: Sparkling Miracle is best applied directly from the lipstick tube. Using a lip liner underneath this definitely increases the wear time as well as opacity of this lipstick. 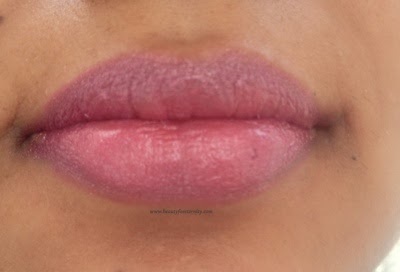 It doesnot give a defined outline to the lips when used without a lipliner so it's always better to outline the lips with a matching lip liner first if you like defined lips. Drawback of Essence Lipstick 'Sparkling Miracle': The biggest con of this lipstick is that it is glittery and I hate when my face looks like a disco ball with glitter particles scattered everywhere. I have to be extra cautious while wearing it so that I don't touch my lips with my hands.After wearing off also, this lipstick leaves glitter particle stuck to my lips which I hate. It could have been a everyday type wearable lipstick only if it was without the glitter. Appropriate occasions to wear 'Sparkling Miracle' Lipstick: It's a lovely shade but presence of glitter limits it's versatility. I won't wear it to work. It can be worn with my Indian ethnic wears on special occasions with subtle eye makeup and fresh looking face. You can also pull it off as a lovely spring appropriate colour as well. Given below are some pros and cons of Essence lipstick 'Sparkling Miracle' which will help you to decide whether to buy it or bash it. Go for it if glitter in the lipstick does not bother you. It is a lovely muted berry shade which suits fair as well as medium skin tone and is quite moisturising. 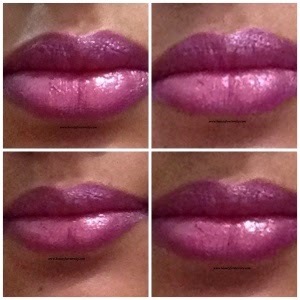 Unlike other glittery lipstick it looks quite subtle on the lips and can please people who like shiny lips. Considering it's price, it can be given a try. I will not repurchase this particular shade but definitely a non-glittery one from this range of Essence lipsticks because these are quite moisturising and affordable.